Wolfgang Puck's casual restaurant and lounge in The Ritz-Carlton, Los Angeles offers views, craft cocktails and signature Asian dishes. 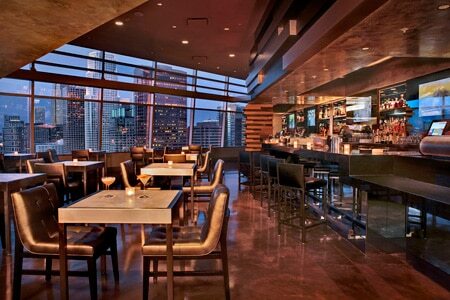 : Wolfgang Puck's Nest at WP24 is a more casual, modern restaurant and lounge adjacent to his fine dining venue WP24. Located on the 24th floor of The Ritz-Carlton, Los Angeles, expect superb views and craft cocktails and wines. Signature dishes are found alongside some of WP24's most popular plates, including sushi, prawn toast, Chinese crystal dumplings with king crab and pork, General Tso's chicken, crispy black pepper pork belly and roasted Cantonese duck.